At six stories, the Stangenwald building was considered Hawaii's first skyscraper and one of the most prestigious addresses in Honolulu. Designed by noted architect Charles William Dickey, construction of the steel-frame and brick building began in 1900 and the building was completed in 1901. The Stangenwald Building melds Italian Renaissance Revival elements and a hint of the Romanesque Revival Style with arched windows, terra cotta ornaments, and a wide balcony with fine grillwork above the entrance. Dr. Hugo Stangenwald, the "student revolutionist, Austrian émigré, able practicing physician, and recognized early-day daguerreotype artist (photographic process,)” left Austria in March 1845. After living in California, he arrived in Honolulu in 1853. He married the former Mary Dimond in 1854. He opened a shop in late-1854 in a one-story frame structure on the site of the present Stangenwald building. His advertisement was well-known: "To send to them that precious boon, And have your picture taken soon, And quick their weeping eyes they'll wipe To smile upon your daguerreotype." Stangenwald bought the Merchant Street property in 1869 and formed a partnership with his fellow-physician neighbor, Dr. Judd. In January, 1899, Stangenwald leased his property to a hui, a limited partnership firm which was to lease his property from him and erect a building there to match the quality of the Judd Building (1898) next door. Though the project was named for the well-known physician and photographer, Stangenwald had little to do with it. He died in June of that year. The hui sold its interest in the land to the Pacific Building Company, newly formed to finance the project. The building's earliest occupants were lawyers, many of whom were in the hui and so had a vested interest in the building, so that early conceptions of the building included a law library and a Business Men's Club, though neither were realized in the final building. The Stangenwald Building's steel frame supported a decorative structure, "with dark terra cotta and pressed metal trimmings and cornice, massive in design yet promising a pleasing effect. This building is of the most modern style of fire-proof architecture, designed with completeness of office conveniences equal to that of any city." Honolulu's business community seemed to agree, for its prestigious address was claimed by several of Honolulu's most prominent company names: The Henry Waterhouse Trust Company, BF Dillingham, Castle and Cooke, Alexander & Baldwin and C Brewer Companies. 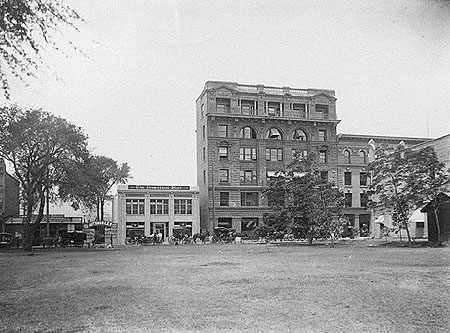 It was part of downtown redevelopment plan and construction boom in the wake of the terrible Chinatown fire that destroyed blocks of buildings in 1900. The Stangenwald remained the tallest structure until 1950, when the seven-story Edgewater Hotel in Waikīkī took over that title. Renovated periodically throughout its life - including alterations to the original ornate cornice, the Stangenwald was the subject of a major rehabilitation in 1980. The image shows The Stangenwald Building in its early years. In addition I have included other images and maps in a folder of like name in the Photos section on my Facebook page.